I just wanted to remind everyone that as we know the holidays are right around the corner, don't forget that by holiday grocery shopping at ALDI you can save half your bill and the quality of the food is just as good. And as always their produce is always perfect!! I have only noticed that you need to be picky and choosy with your apples, because some may be softer than others, but if you use the apples to bake with then choosing the softer ones actually work out. Stay tuned for wonderful holiday recipes for the upcoming holidays: Halloween, Thanksgiving, and Christmas and more tips for your holiday grocery shopping. What holiday products have you tried from ALDI and love using with your recipes? Post here and let us know!! 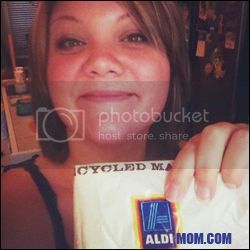 And I am also collecting ALDI product holiday recipes so please email them to TheAldiMom@yahoo.com along with your name and location so you can receive credit!